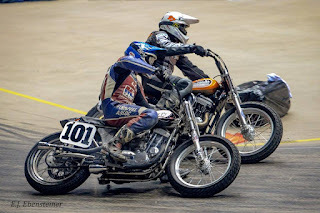 Of course, I knew that Billy Hofmeister planned to have his “Lee’s Speed Shop” modified Iron Head 900 Sportster in the competition, but I had no idea who he had lined up to ride it, or the number it would carry or even the name of the class it would complete in. In fact, his bike has a fresh paint job on it this season with lettering on the tank that is a bit harder to pick out than it has been in previous iterations. That meant I really had my eyes peeled to identify Billy’s bike. Each race started just below where we were seated so I couldn’t’ really get a look at them there. So here we are sitting in the stands next to Brian Klock and some of his friends, watching one of the last semi-finals and I keep thinking that the #101 bike running in second place might just be Billy’s, but they are moving fast enough that for the life of me I can’t read the lettering on the tank or even tell for sure that it’s an Iron XL. What’s more, I didn’t want to sound like I was starved for attention, so I kept my mouth shut to those around me about my suspicion that it might be the bike with my porting. When the rider of the 101 bike came underneath and won the semi on the very last turn, and the crowd went wild in reaction, I knew it was time for Jane and I to make a trip to the pit area to find just who we should be cheering on. Of course, I was pretty hyped to find that it was indeed Billy’s bike carrying the 101 number plate, with rider extraordinaire Mac McGrew giving the crowd the biggest thrill of the night, …at least up to that point. So, back to our seats where I did my level best to act as though I was still modest as I let everyone know that the excitement we had just witnessed could be linked (no matter how tenuously) to my porting. But the show wasn’t over yet. As Mac lined the old Sportster up for the finals in the Pro Hooligan class, we all expected quite a show, but no one could foresee just how that show would unfold. At the very start of the race, going into the first corner in the middle of several other bikes, somehow Mac wound up on the ground and separated from the bike. Apparently neither he or the old Iron Head were quite ready to call it a night just yet though, because Mac quickly picked up the still running Sportster and pointed it toward the rest of the pack. A 10-lap race on such a short track doesn’t allow much time for making up ground, but over the next bunch of laps Mac worked his way up from dead last all the way to second place, when he caught his handlebar on another bike, sending the Iron Head into the wall and breaking the front wheel. Not quite a fairy tale ending, but definitely some of the most action-packed racing one is likely to see anywhere! Congratulations and a big thanks to Mac McGrew and Billy Hofmeister for all the big shots of adrenaline! That performance was the talk of the bike show for the rest of the weekend. then closes the door behind her!